Boudoir is a perfect name for this fragrance, everything about it screams glamour and it also works really well as part of the Vivienne Westwood aesthetic – classic but unusual and surprising. 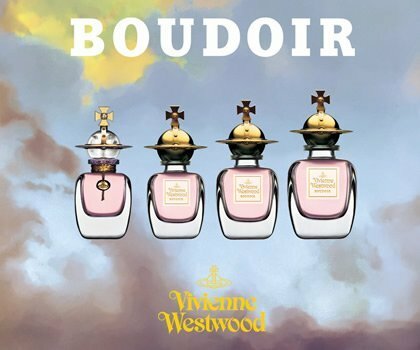 Boudoir opens with good degree of sparkling aldehydes, bright bergamot and sweet florals. There is something very ‘old school’ about the aldehydes that makes Boudoir smell like something that was released in the early 80’s rather than the late 90’s, but unlike a lot of the fragrances from the 80’s it doesn’t smell dated. Rose jumps into the foray pretty quickly and Boudoir’s rose is sweet and its green nuances are amplified by strong jasmine. Bitter, indolic orange blossom gives some stability to the composition and stops the rose from being overbearing or too sweet. Viburnum is also listed, and I remember reading somewhere that it is Westwood’s favourite flower (it is also appeared in her second perfume, Libertine), having never smelled it I cannot comment on how it smells, but I cannot smell anything unusual so I’m just going to go ahead and say that it smells ‘floral’. The sweet florals combined with orris give the impression of face powder, and everything about Boudoir makes me think of a light pink, silk adorned Boudoir where a glamorous woman applies her make-up, fragrance and outfit ready for the night out, or in perhaps. Now, you would expect that a perfume given the name ‘Boudoir’ to contain a good deal of raunch, after all beautifying oneself isn’t the only thing that happens in the Boudoir. This Boudoir doesn’t disappoint, there is a good deal of skank, the kind of skank that is reminiscent of warm, sweaty bodies, however it isn’t a skank fest. Civet is listed as a base note but I would say the raunch/skank in Boudoir smells much more like cumin, and you cumin-phobes out there may or may not like Boudoir, it entirely depends on your level of tolerance for the note, but I would say it’s relatively tame, it simply adds a human warmth that feels comforting rather than disturbing. As I mentioned earlier, Boudoir is classified as a ‘Floral Chypre’ and whilst it may not smell like an old-school chypre in the same vein as Mitsouko, it definitely smells more like a chypre than the slurry that is passed of as one nowadays. Boudoir’s base is a blend of patchouli and sandalwood, it is warm, dry yet creamy (you’ve got to love the way that sandalwood does that) and slightly bitter. Tobacco ensures that Boudoir always stays sweet right to the end, and also gives the base an attractive dryness. It looks like I owe Boudoir an apology, she has been dragged out of the ‘purgatory drawer’ and is no longer shunned, in fact I have already ordered myself a replacement bottle because this one is almost finished. Maybe I should dip into the purgatory draw more often? Boudoir is designed to look glamorous on the dressing table in any boudoir. The pale pink juice (which turns golden brown over time) is topped with Vivienne Westwood’s signature ‘Orb’. Trés Westwood! Boudoir is available in 30ml and 50ml Eau de Parfum, with prices ranging from £34-£49, it used to also be available in 75ml Eau de Parfum and 20ml Pure Parfum, but both have since been discontinued. Some matching body products are also available. There have been two Boudoir flankers; ‘Boudoir Sin Garden’ and ‘Boudoir Jouy’. Have you recently rediscovered any forgotten loves? Let me know in the comments box below. You should also head over to Olfactoria’s Travels where Birgit has been discussing our ‘Fragrant Regrets’. This review is based on a bottle of Boudoir from my own personal collection. Posted in Aldehydic, Chypre, Feminine, Floral, Vivienne Westwood and tagged Aldehydic, Boudoir, Chypre, Feminine, Floral, Raunchy, Vivienne Westwood. Bookmark the permalink. Before I forget: is a draw the same thing as a drawer? You’re welcome! It seems you’ve always had good taste in perfume! I think the distribution of Vivienne Westwood scents is quite wide, she’s in most department stores here so I would imagine she would be in Texas, shame on her if she’s not! Oh, I want to try this…I’ve never seen this perfume before, though! Hm. There has to be some place in NYC that carries it. It’s a great scent and I think you’d like it, there must be somewhere in NYC that carries it! Boudoir was one of my early – and moderately terrifying – instances of exposure to civet, which I do get in this, though I take your point about cumin possibly passing itself off as my (former?) nemesis note. I love your description – ‘Pyrotechnical Spectacle’ is particularly evocative! But yes, I agree that is a lot going on, and perhaps not all good from a (former) civet-hater. No way! I’m so chuffed you’ve reviewed this. I literally wore this solely for years and it gets so much slack. Boudoir is an awesome fragrance and it is so naughty. A girlfriend of mine once said she hated it because “it smells like p**sy” crude I know sorry but it’s very… feminine raunchy. ‘Feminine Raunchy’ is spot on, it smells of hot, sweaty flesh. I think I get the same as you within the dry down, sweet powder and raunch. I totally get the Putain des Palaces reference – we seem to share a lot in common, taste-wise.